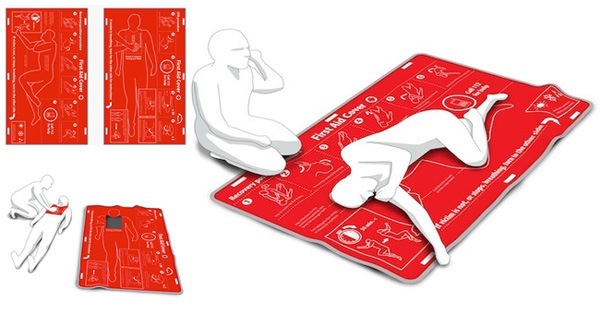 The First Aid Blanket is a smart creation that will allow people who never learn CPR and life-saving manouver to applicate it immediatly. The particulary of this idea is that it comes from 2 different sides of the world, at the same time. The First Aid Blanket and the First Aid Cover are two different project, but they want to resolve the same problem: define in a simple way rules of CPR for people who never learn it in their life. “I love the world of inspiration, imagination and concept design! How else is it possible that we have two strikingly similar concepts, designed by teams that are geographically poles apart and both go on to win prestigious design awards. Take a look at the First Aid Cover by Jussi Koskimäki here, now come back and review the First Aid Blanket. Jussi bagged the prestigious Braun Prize, while the Asian team has bagged the Red Dot Awards. To be honest I love them both, because of their practical approach at guiding lay people in first aid.